COMMENTS: I ordered this book because I'd like to start selling my soaps and I thought it might be helpful. This book is well written in simple language. 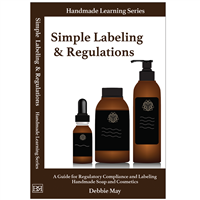 Debbie May explains the basics, gives information about starting up a business, labeling, laws and requirements and a few recipes also. It is a good comprehensive book for someone looking to start a soap business or just the home crafter looking for answers to question. Even though I had figured quite a bit out on my own before reading-this helped explain the whys and hows. Its a quick read, and I am sure I will reach for it and reference back to it in the future whether I decide to start up a business or not. COMMENTS: My sister in law and I are in the beginning stages of starting up our own small soap business. We started with melt and pour soaps and have learned a lot. This book is full of the information we have been looking for in 'many places' and it's been condensed into this book! Thank you! COMMENTS: This is a must have book for any M&P maker. I'm an experienced M&P soapmaker (15 years) and picked up a several new tips in this book. Well worth the price, especially if you sell your products. COMMENTS: I love everything about this book, the step by step instructions, packaging ideas, and how to label. Debbie covers it all. This book is a must have for the novice and veteran. Thank you! • The Pro Tips are great! "Excellent - One becomes a professional Soapmaker"
COMMENTS: This book gives you the knowledge to become a professional Melt & Pour Soapmaker. This is the first book, that I will read. However, the topics discussed, are applicable to all aspects of the industry, which include, scenting, color additives, additives, molds, packaging, labeling and to hobby to business. The inspirations with the recipes are indeed inspiring. The Hobby to Business section is a frank discussion of the pros and cons of going into business; includes questions to ask yourself before making the big decision. It reads and flows like a novel, which makes reading it enjoyable. COMMENTS: Everything you need to know about melt and pour. Very detailed, I had situations that happened to me addressed here without even thinking, the solution was right there. Step by step. I thought it was going to be boring. I couldn't put this book down. I was impressed with the recipes provided. Got to try to make them, I especially like the embed paper design. Keep up the good work! • Don't change a thing, its perfect. COMMENTS: Very comprehensive. Highly recommended. "Yay for Melt and Pour"
COMMENTS: Thank you for loving us Melt and Pour soapers. I read this book on my flight back from the conference. I love it. I especially love the format so if I have my own recipe and just need to know how to do something like embedd I can go to that section. I am so excited to have access to this simple to use book. "Not a Melt & Pour Girl But...."
COMMENTS: This book definitely makes me want explore that side of soap making. I've never had the urge to explore melt and pour but Debbie really makes this side of soap making an art and gives me great appreciation for the melt and pour process. • Makes Me Want To Try Melt and Pour! "Melt & Pour Soapmaking Book"
COMMENTS: An Excellent book, very much recommended. Testing your knowledge section of the book is very helpful to understand the melt and pour soaping. It also contains recipes with picture of the soaps that are very helpful. I highly recommend the purchase of this book. "Best Book on the Subject Availavle"
COMMENTS: Debbie May has taken all of your years of knowledge on the subject of Melt and Pour Soaps and placed it into this amazing and comprehensive book. I have been soaping for nearly 5 years and I find the information, tips, step-by-step instructions in this book to be second to none! This book is wonderful on so many levels-- whether you are a first-timer or a seasoned expert-- there is so much in this book for you. Debbie has a way of making even the most complex information easy to follow. Best book ever! "melt and pour soapmaking book"
COMMENTS: I really liked this book, it was easy to read and the information included in this book has helped me in many, many ways. "Great reference book for melt and pour soap"
COMMENTS: Debbie May's Melt and Pour Soapmaking book is a great reference for all soap makers, beginner to experienced. From troubleshooting to recipes, this book is easy to read and informative. I'm happy I'll have it on my book shelf. "I wasn't sure I needed this book, but..."
COMMENTS: I'm glad I read it. I've been making M&P soap for nearly 12 years and was given a copy at the Handmade Conference. I flipped through it thinking it might be interesting, but nothing I would need to know. This book is full of information! She talked about regulations, pH, Good Manufacturing Practices, Best Used & Expiration Dates, Labeling, Going from hobby to business and so much more. If you want a break down of colorants, additives, how to make soap without a recipe and more, this book is a wealth of information. Even if you don't make M&P soap, there is so much information you can use as a soap maker that still applies. It's truly a complete guide and the recipes are great! COMMENTS: I was hesitant to get this book but very glad I did. The amount of information makes it worth the price. "Highly Recommend – This book is amazing. " COMMENTS: I will highly recommend to both newbies and experienced makers. It covers so much material! COMMENTS: Most books I have are recipes only. This can see how this book will help me troubleshoot problems. COMMENTS: I was at Handmade Conference when Debbie introduced this book. I started reading the book on my flight home and was amazed at the content. If you read the book and take the time to understand the information then you will never need a step-by-step recipe again. "Great Book For MP Soapmakers "
COMMENTS: Love how much info is in this book! Very well written for the novice soapmaker. COMMENTS: I am new to soap making and really like the different technique directions. I wish I had this book earlier and I would not have wasted so much of my time. "A comprehensive book for melt & pour"
COMMENTS: Even though I’ve been working with melt & pour soap for 4 years, this put is all out there- the “why is there in there and how.does it work” questions are answered in a clear and conscience manner- one that makes it easy to absorb. Once reading the book you’ll wonder how you’ve gone on with your business without it! Truly, this paired with the other book are MUST HAVES for anyone in the bath products business. Written in a manner that newbies to the business will easily understand. "Great book for melt and pour"
COMMENTS: Debbie's book goes through all the steps of making melt a d pour soap, from additives to color and beyond. Towards the end of the book are pictures of soaps that you can make using your new found knowledge. This book is very inspirational and great for beginners and experienced melt and pour soapmakers. "Does the book have recipes for the soap base? I am interested in making my own soap base. Thanks." Staff Answer This book does not tell you how to make melt and pour soap from scratch. It explains the ingredients used and why they are used. It also describes different techniques in using melt and pour soap to make beautiful and unique bars of soap.